Welcome to Baylor University’s Master of Public Health (MPH) Degree with specialization in Community Health. We equip students to promote population health in a wide range of public health settings. Our strong practice-based approach, global health opportunities, and low faculty-student ratios provide our students with a quality learning experience that can enhance career development. Click on the information links provided on this page to learn more about our program and career opportunities. PARTNER WITH US IN COMMUNITY PROJECTS! Is your organization or agency engaged in community/public health promotion? Our faculty and students may be able to partner with you through our Community Health Partners Program! If you major in our Bachelor of Science in Public Health (BSPH) program, you may be eligible for our 5-year joint degree program: BSPH/MPH in Community Health. For more information, contact Dr. Beth Lanning at Beth_Lanning@baylor.edu. PRELIMINARY SELF-STUDY READY FOR REVIEW! 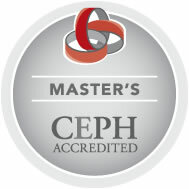 The Baylor Public Health Program was accredited in 2013 by the Council on Education for Public Health (www.ceph.org). We are in the process of review for reaccreditation. To review our report click on: Self Study. Click here to provide third party comments about our program directly to CEPH: Call for Comments.